How Can YOU Kill And Get Rid Of Flies ? Flies have been a major nuisance to humans and animals for thousands of years. Many transmit disease causing organisms and are linked directly to typhoid, cholera, dysentery, diarrhea, pinworms, roundworms, whipworms, hookworms and tapeworms. Most flies have filthy habits that make them efficient disease transmitters. Disease causing organisms are picked up by flies from garbage, sewage, rotting debris, dead animal carcasses, animal excrement, etc and are directly transmitted to us by way of their mouthparts or through their vomit or feces to our food, our food preparation surfaces, our sanitary items and to almost anything that we contact. 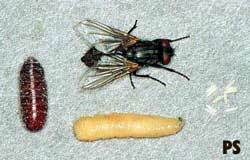 Most flies lay their eggs in warm moist materials that will furnish a food source for the developing larvae (maggot). Animal and human feces, garbage, diaper bags, rotting vegetables, and even ground with excess organic matter will provide a suitable egg depository. Once deposited the egg hatches and a larvae resembling a small yellowish worm called a maggot emerges. Fly larvae will normally pupate or form a hard brown colored pupa shell around their body in 4 -7 days. When fully developed the adult fly breaks open the end of the pupa shell and emerges. Adult flies are often ready to mate within hours of pupating. During warm weather, most flies can have 2 or 3 generations per month. The average adult fly lives about 20 days. Normally, fly populations build over the summer and are the greatest during the early fall months. At the end of the fall, flies prepare to overwinter and will remain in their pupal casings where they are protected from the elements. 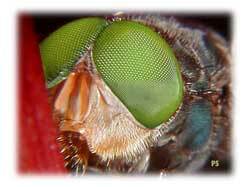 It is thought that flies like most insects will secrete an "antifreeze protein" while in their pupal casing which protects them from the cold and the harsh winter elements. This is why flies are found as far north as Alaska and Northern Canada. During the summer and fall months, controlling flies can be a never ending task. Any flying insect can travel hundreds of feet or yards, even miles in some cases away from their breeding areas. Caught up in a wind current, flies can literally travel the from region to region or State to State in some cases. This is why taking a few extra precautions against flies can save you from a big fly headache down the road. Knowing and understanding the species of the fly that you are dealing with is very important. This page gives you general fly control procedures. If you need specific fly control methods for a particular species of fly, click here. Proper sanitation and housekeeping are crucial in controlling flies. No amount of chemicals or traps will control flies if a few basic steps are not followed. Implementing the following steps is the very basis for fly control in and around homes and buildings. Remove garbage at least 2 times per week. More often if rotting meat, poultry or fish is disposed of. Some fly species can complete their life cycle in as little as 3 or 4 days. Disposing of rotting garbage is critical to fly control. Make sure that garbage cans or dumpsters have tight fitting lids. Rotting garbage odors attracts flies. Do not allow flies easy access to garbage. Use a liner in your trash can if possible. Do not allow garbage to accumulate in the bottom of trash cans. Steam clean and disinfect garbage cans and dumpsters periodically to help eliminate odors. Keep garbage cans as far away from doors as possible. This will attract flies away from the building. Commercial Kitchens should make sure that floor drains are screened and grease pits are emptied and cleaned at least 1 time per month. Keep doors and windows closed or screened. This the # 1 way flies enter buildings. It is extremely important that there are no holes or rips in window screens, and that doors close properly. Check to make sure that door sweeps are in good condition. Commercial kitchens should consider using an "air door" that blows flies away from openings and helps prevent their entry. Pick up animal excrement and droppings. Flies will feed and deposit eggs on animal droppings. Get a pooper scooper and bag your doggies droppings at least once a week. More often for larger dogs with larger droppings ! Remove dead animals or birds that have died in the attic or walls. Dead animals emit odors that will attract flesh flies, bottle flies, etc. Keep exposed food covered. Flies can transmit disease and lay eggs directly on exposed food. Do not over water houseplants. Make sure houseplants are well drained and do not stand in water. Over watered and soggy houseplants are the number 1 reason for indoor gnats. Do not let food buildup under tables and in hard to reach areas. Mop or steam clean your floors on a regular basis making sure to get to all those hard to reach areas. Do not let floor drains stand in water. Floor drains can become clogged with organic residues. This organic residue will actually "line" the drain sufficiently enough to allow drain flies and fruit flies to breed. Pouring bleach or acid down the drain will not help. Drain odors are usually the first sign of trouble. Use Drain Gel regularly on floor drains to remove and prevent organic buildup. Use Air Curtains on commercial kitchen doors to keep flies out. Air curtains are usually required by local health departments. House Flies come from the outside. The treatment strategy for flies is to reduce the outside attraction if at possible. This includes removing garbage, eliminating odors such as those caused by pet droppings, animal droppings, stagnant water, mold, mildew, etc. If the outside conditions cannot be controlled such as those on farms, ranches, commercial properties, lakeside or ocean side communities, etc., then your fly control efforts will have to be through a continual ongoing program. Outside areas should be cleaned and raked whenever possible. Elimination of odors that attract flies is of number 1 importance. Make sure that doors and windows are screened and sealed. Open doors and windows are an easy invitation for flies. Make it hard for flies to get inside. Do not place bug zappers on porches, patios or within 100 feet of the outside areas of homes or buildings. Place electrical bug zappers at the farthest point possible away from the house. This will attract flying insects away from the house and not to it. Electrical bug zappers will cause the insect to explode releasing body parts into the air and surrounding areas. Do not use electrical bug zappers indoors, near barbeque pits, or other places where food is prepared or served. Outdoor sprays such as Bifen or Talstar work well to kill and repel flies. Spray all outdoor areas if possible including the sides and even the roof of the structure in some cases. Repeated use may be necessary for good control. Fly Baits such as Maxforce Fly Bait and Golden Malrin work well to attract and kill flies. These baits contain a fly attractant or "pheromone" called muscamone that attracts flies from as far as 15 feet. Place into a tamper resistant station such as the EZ Strike Fly Bait Station or as a last result sprinkle sparingly around trash containers, dumpsters, doors, etc.. Do not use fly baits where animals or pets can eat them. In backyards or commercial areas where widespread fly control is needed, use a mister / blower such as the Dyna Fog Hurricane ULV Mister Fogger and apply Vector Ban Plus or Riptide to kill flies on contact and repel others. Garbage should be removed on a daily basis. Use plastic trash liners and twist and tie them when disposing of them. Do not empty garbage or trash into metal trash cans without liners. Not using a trash can liner will cause odors and organic residue inside cans that will attract flies. If you cannot use a liner for whatever reason, wash the trash can out with a disinfecting cleaner such as Lysol or Mr. Clean on a regular basis. Indoor sprays such as Demon WP are somewhat effective in controlling flies. Be sure to spray window sills and other fly resting spots. Do not spray TV's, lamps, etc. with insect sprays. CB 80 Pyrethrum Aerosol contains Australian pyrethrum that is lethal to flies. Fog CB 80 liberally into the air in rooms, garages, etc, where flies congregate. A quick spray around windows will kill flies that are trapped behind curtains and blinds. Maxforce Fly Spot Bait is a product that is actually a bait, but is diluted with water and sprayed. This product is safe enough to be used indoors, even in restaurants. It can be sprayed directly on walls, trash cans, door frames, window sills, etc., even in dining areas and kitchens. When the flies land on it, it kills them in seconds. It is very effective and highly recommended. Commercial kitchens and bars should be aware that fruit flies love the smell and taste of beer. Beer spilled on floors should be mopped or rinsed off every night to prevent fruit fly infestations. The use of a commercial floor cleaner/sanitizer also helps. Drain Gel helps to remove the organic buildup caused by washing grease and food down floor drains. Use Drain Gel on a weekly basis. 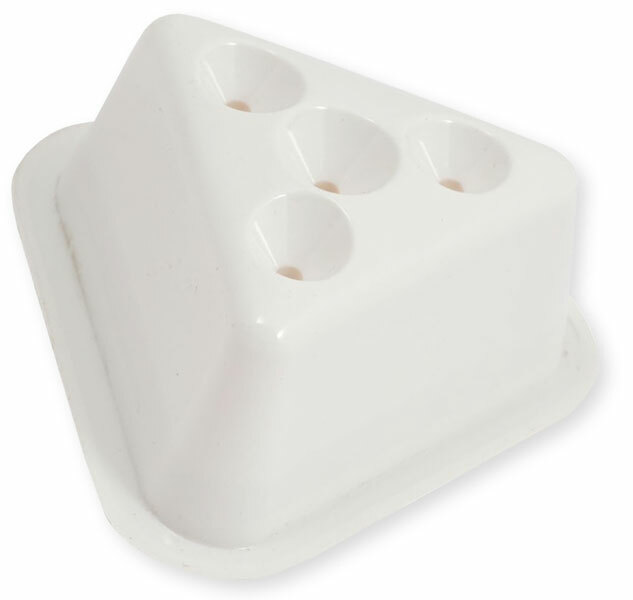 Fruit fly traps such as the Natural Catch are very effective at catching fruit flies and can be placed directly on bar tops and other food preparation surfaces where regular pesticides cannot be placed. Commercial Fly Traps such as the Vector Fly Trap are the industry standard for capturing house flies and keeping a fly free kitchen. Fly Paper and glue strips are somewhat effective at capturing flies, but in most cases do not attract them and depend on an attractant of some sort or a shiny surface. Fly paper is messy and not very sanitary. For this reason, fly paper is not recommended for use in kitchens or other indoor sanitary areas. Time Release Misters that dispense pyrethrum on a regular basis are also somewhat effective at controlling flies. Place time release misters away from food areas and do not place in areas where people will remain for extended periods of time. Electric Fly Light Traps - Light traps are highly recommended for fly control indoors. They are safe, capture the entire fly and are easily maintainable. Light traps work best at night when there is no other light sources to attract flies. Light traps should only be placed indoors. The UV light emitted from Light traps will attract flying insects from hundreds of yards. Light traps contain a glue trap that catches flies and does not cause them to explode. 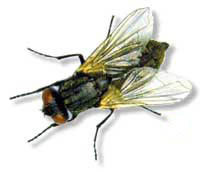 Place them near food, garbage, in kitchens, in offices, in bedrooms, living rooms, and anywhere flies are a nuisance. Electric Fly Zappers - Fly zappers are recommended for use outdoors only. Fly zappers contain an ultraviolet bulb that attracts the fly, and a metal grid or screen that zaps the fly when it lands on it. Fly zappers usually contain a holding bin at the bottom of the unit that captures dead fly particles and body parts. This bin must be emptied and cleaned on a regular basis. Due to the fact that Fly zappers do not capture the fly, but cause it to explode when it lands on the electric grid, fly body parts can become airborne and float. For this reason, Fly zappers are not recommended for use indoors, and are not to be used in kitchens or sanitary areas. Only use Fly Traps that contain a glue board or some way to capture the fly in these areas. Outdoor fly control can be a non-stop, extremely challenging task. Using the right products in combination with sanitation (where possible) can provide satisfactory results. 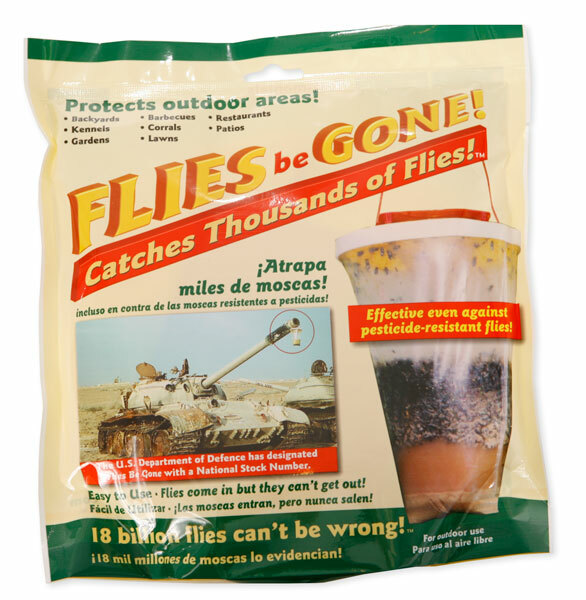 100% control of flies outdoors in rarely possible, as flies can come from anywhere at anytime. Even in cold or frigid conditions, given the right circumstances such as heat, water, etc, Flies can propagate in as little as 3 days, and leave you wondering where they came from. Liquid sprays such as Vector Ban, Riptide, Bifen and others work well to kill flies on contact and provide some continual effectiveness. These products can be sprayed by hand with any pump type sprayer and can also be used in misting systems for barns, and outdoor areas where a continual spray is required. For more about misting systems, visit our Mosquito page, and how to get rid of mosquitoes. Handheld fogging of outdoor areas, yards, barns,etc, is also possible with the Hurricane Dynamite Fogger. This fogger works well and can be attached to a long extension cord and carried around for fogging away from buildings, etc. A back pack fogger such as the Solo Power Mist Blower is the standard of commercial pest control companies and lawn maintenance firms. Electric Fly Zappers will attract flies from a great distance. Placing Electric Fly Zappers close to the building will attract them to the building. Be sure to use Fly zappers as far from the building as possible, but not more than 100 feet. 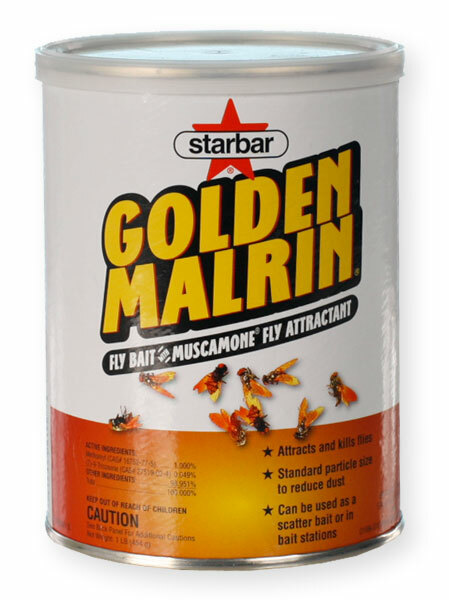 Fly Baits such as Golden Malrin and Maxforce Granular Fly Bait work especially well to attract flies and kill them. Use these baits either as a scatter bait on the ground in and near areas where flies congregate such as around dumpsters, doors, etc. Do not use scatter fly baits in areas where animals or pets can pick it up and eat it. Where animals, pets, or children can possible gain access to the bait, use EZ Strike Fly Bait Stations attached to buildings, fences, etc. Be sure to attach these stations at height not reachable by animals or children. Maxforce Fly Spot Bait is a newer product that is actually a bait, but is diluted with water and sprayed. Use Maxforce Fly Spot Bait in and outside of dumpsters, trash cans, doorways, and anywhere flies land. When the flies land on it, it kills them in seconds. It is very effective and highly recommended. Don’t Buy Retail Fly Control Products ! Most over the counter fly control products sold at hardware stores and retailers do not contain the same attractants or active ingredients as professional use products. Although the packaging and advertising may appear convincing, millions of dollars are wasted by consumers annually on over the counter products that simply do not work. For this reason, ePestSupply is committed to offering only the finest Professional Quality fly control products and at the lowest possible price. You can depend on ePestSupply and our commitment.